Loyd says this was due to an unusually deep and persistent trough of low pressure just off the West Coast, coupled with an atypically strong jet stream aimed right at Washington. The result? A parade of storms that contributed to making October a month for the record books. Record weather events can spawn other records, which in this case was the massive emergence of mushrooms, especially in eastern Washington. Lori Carris, WSU professor of mycology and member of both the British and American preeminent mycological societies, says that the record rainfall resulted in the appearance of some unusual types of mushrooms, such as a beautiful fruiting of the cauliflower mushroom along a trail on Kamiak Butte (found by graduate student Erika Kruse). Never had she seen it in her 27 years of collecting in the Inland Northwest. The abundant rains resulted not only in the fruitings of choice edible mushrooms but also some rare species appearing in unusual locations. Common forest mushrooms known as elfin saddles were even seen emerging in Pullman lawns. As a result of the record October rainfall, the regional forests were awash with many colorful mushrooms, much to the avid hunter’s delight. Golden Chanterelle (Cantharellus spp.) 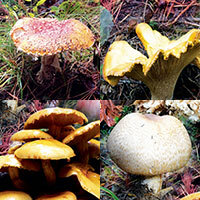 — several species of these choice edibles are found in the Pacific Northwest. Cauliflower mushroom (Sparassis radicata) — an unusual-looking fungus and actually a good edible. Found by WSU graduate student Erika Kruse. Rosy Russala (Russula rosacea) — one of the most beautiful mushrooms of the forest, very abundant this year. Found by adjunct professor Pat Okubara. Lemon-yellow Pholiota (Pholiota limonella) — these slimy golden caps grew in spectacular clusters last fall. The Prince (Agaricus augustus) — a stately and wonderfully almond-scented mushroom related to the cultivated button mushroom. From Pat Okubara. Western Black Elfin Saddle (Helvella vespertina) — common forest mushroom found in yards last fall! From Erika Kruse.